If Google has Zeitgeist 2010, then Twitter has its own review of the year that is almost gone. Twitter recently released the top trending topics on 2010, and if you want to know if you were “trendy” this year (or if you have nothing better to do), you might be interested at poring over the lists. 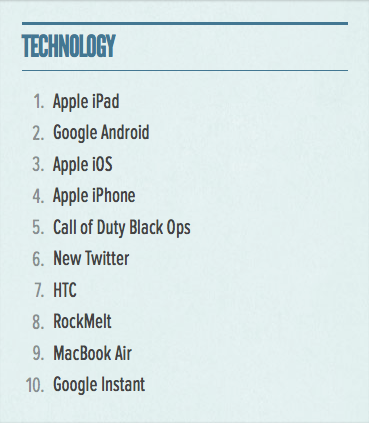 Narrowing the trending results a little bit, here is the list for trending topics in technology. Now it really is not surprising that Apple has practically hogged the list, is it? I am surprised, though, that Call of Duty Black Ops has made it to number 5. If the reaction of friends are anything to go by, the game is really something else, but I thought that the New Twitter would have ranked higher. There are other subtopics listed – check them out at Twitter Year in Review.